Your stamp guide or MISTI will be of great assistance for this set (especially when stamping multiple projects) but since it is clear, you can probably eyeball it just as easily. Here are some of my step-out photos, using my MISTI. I tried stamping the globe stand both ways, first and last, and ended up preferring stamping it last -- I felt it was easier to make sure the stand fit around the already-stamped globe. My next card has the globe stamped onto muslin fabric! I simply wrapped the muslin around a piece of cardstock, and stamped it the same way I did the card above (in fact, I stamped both projects at the same time, in different colors, leaving each of the layers of stamps on my MISTI)! You can find a full list of hop participants celebrating this beautiful stamp and die set over at the Ellen Hutson CLASSroom blog today. And please remember -- this Stitched Together stamp and die set was only produced in a limited quantity, so when it's gone, it's gone forever! Hello and happy Monday, Friends ... Today I have a bright rainbow full of birthday cheer for you! Then I die cut the cupcakes with their coordinating Spring Bunnies die set and glittered them with Nuvo Glitter Gloss Aqua Shimmer. Next, I die cut Sentimental Happy Birthday from X-Press It Blending Card and colored it with the same markers, with an ombre effect. To complete the card, I anchored the birthday die cut with a piece of washi tape, and stamped the Sweetest sentiment (also from the Spring Bunnies stamp set). 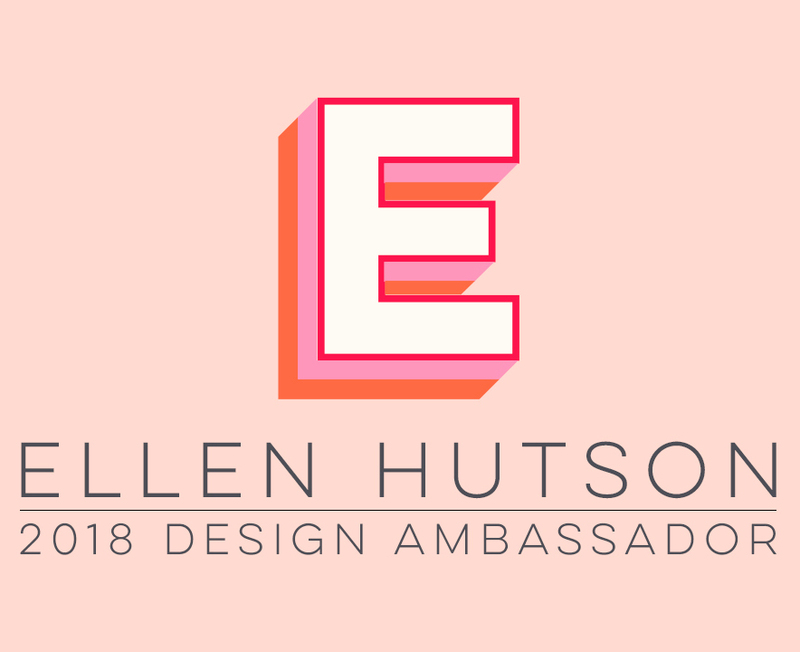 I also wanted to let you know about this great sale happening over at Ellen Hutson LLC on EVERYTHING ! ! Shop early, for the best in-stock selections! Thanks so much for joining me today! Hello, Friends ... Happy Sunday! Today I have a simple 2 or 3-color watercolor technique to share with you, using the GORGEOUS new Mondo Sakura stamp set from Julie Ebersole for Essentials by Ellen, available NOW! To color this beautiful floral image, first I heat embossed the image with gold detail embossing powder onto watercolor cardstock. The embossing helps to hold your colors within the lines and not bleed into other areas! Then I used Daniel Smith PrimaTek watercolors: Rhodonite (pink) and Jadeite (green). I simply watered down the pink color until it was very light and applied it to all of the flower petals, leaving some white space around the upper edges of each of the petals. Then I just gradually mixed in a little more of the pink color, to deepen the centers and lower edges of the petals. By gradually deepening the color, you can achieve wonderful shading with just one pigment! I did the same thing with the leaves and stems. Once the flowers were colored, I used Dandelion Kirarina WiNK pen to fill in the centers of the stamen. Optional: Add a third color to fill in the background. I used my favorite mixed aqua combo, using Kuretake Gansai Tambi watercolors, extremely watered down, to wash over the background around the flowers. Another beginner tip: Water down your color a LOT so that it is lighter than you think you might like. You can always add a little more pigment, but it is difficult to take it away once it's on the paper! To finish the card, I used one of the fabulous sentiments from Julie's new Totally Random Sayings Vol. 2 stamp set, gold heat embossed onto Essentials by Ellen 40 Lb. Vellum. I absolutely adore the mix of large and small, and handwritten fonts in this set! To secure the vellum sentiment strip to the card front, just fold the left free edge of vellum and secure it between the layers of cardstock. The lower edge of the card front and watercolored panel were cut away with Pretty Pink Posh's Scallop Borders 2, along with a mat layer of Bazzill Lollipop cardstock. Watercoloring has been one of my very favorite coloring techniques since I first started stamping about 14 years ago ... I hope you'll give it a try and will find these tips helpful. You can find the rest of this gorgeous new release over in Ellen's shop HERE. Thanks for stopping by! I had fun watercoloring my die cuts again! The Honeycomb Square was die cut from watercolor paper I colored with gold metallic watercolor ... it has such pretty golden shimmer! The beautiful Intricate Bee was watercolored with yellow and light black, to help keep it soft and subtle. The bee's wings were watercolored with a white/silver mixture and the cut-outs left/held in place by placing foam mounting tape under them. The background was created by die cutting the Hex Collage out of adhesive stencil material and using it as a stencil to apply aqua watercolor onto a watercolor paper panel. To finish the card, leftover black watercolor was flicked onto the background and the Bee Yourself sentiment stamped in Memento Gray Flannel. I hope you'll join in this month's Memory Box Challenge and create your own Insect/Butterfly/Dragonfly project, for the chance to win some wonderful Memory Box dies!